One of the primary applications for high purity water is for boiler feed water. The measurement of pure water pH can be one of the quickest indicators of process contamination in the production or distribution of pure water. Effective chemical treatment of the feed water is vital in maintaining the useful operating life and minimizing maintenance costs of the boiler. Boilers require pure water to reduce scaling and carryover of impurities in steam. Corrosion can occur when pH exceeds recommended limits at ranges that are dependent on metallurgies with the steam cycle. One location for pH measurement, necessary to insure that the chemical treatment is working effectively, is after the demineralizer. At this point, the water has almost no electrolytic conductivity, making the measurement of pH difficult. In steam cycle applications, pH can be measured at several locations including after water treatment, condensate pump discharge, after polishers if used, and boiler water. The measurement of pure water can lead to a confidence that the water being used remains as pure as possible for the application. The liquid junction of the reference electrode tends to develop an appreciable diffusion potential as a result of the extremely large differences in concentration of ions between the process and the fill solution of the reference electrode. The resulting junction potential can be as high as 20-40 millivolts (approximately 0.5 pH). Any change in this potential will show up as an erratic, drifting pH value. It will appear that there is a change in the process pH, but this change is false since it is caused by the junction potential (Figure 1). Depletion or dilution of the reference fill solution occurs much more rapidly in high purity water, causing the reference potential to become unstable and the measurement unreliable. Since there are no conductive ions to speak of in high purity water, a physical path of conductive reference solution from the reference electrode to the glass electrode must be established in order for the measurement circuit to be complete. If there are no ions provided from the reference electrode (they have been depleted), there will be no stable reference from which to make the measurement. The low ion concentration of pure water appears to hinder the glass pH bulb's ability to detect hydrogen ions. This causes the electrode to have a low response speed. It is also possible that the alkali components of the glass measurement bulb may dissolve in pure water. If a low flow rate exists in the process, the result would be a pH reading that is too high. Another problem involves the buffering capacity of pure water, which is very low. When pure water is exposed to air the absorption of carbon dioxide (CO2) occurs causing a decrease in the pH reading. Depending on temperature and pressure, the pH of pure water may drop to as low as 6.2. Taking grab samples to a lab meter should be avoided because atmospheric CO2 will contaminate the sample. Also, pure water temperature compensation must be taken into account. There are two major temperature effects that must be addressed in order to establish a truly accurate representation of pH in high purity water. The standard automatic temperature compensator only corrects for one of these, often referred to as the "Nernstian or electrode correction." Its magnitude is determined directly, using the Nernst Equation which describes that glass electrode operation which is independent of the nature of the process fluid. Simply stated, the Nernst Equation stated that as a glass electrode increases in temperature, its output voltage increases, even though the actual pH of the measured solution may remain the same. The effect is minimal at, or near a pH of 7 and increases linearly above and below a pH of 7. The second effect is know as the "equilibrium or dissociation constant correction." While this effect is usually much smaller in magnitude, it can become significant. Many of the problems associated with high purity pH can be reduced or eliminated through careful consideration of these critical aspects of the pH measuring loop. Through years of experience and innovative design, Yokogawa has developed solutions for the problems previously discussed. The high diffusion potentials of the reference electrode can be overcome by using a positive pressure style electrode. 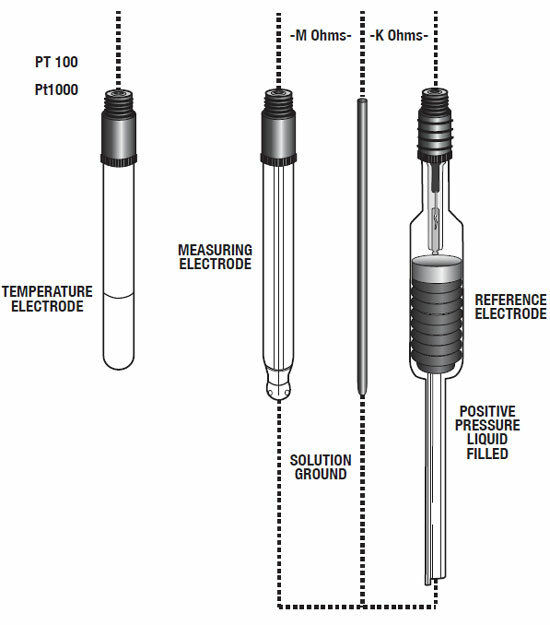 One such electrode, called the "Bellomatic," was developed (Figure 1). Utilizing a large refillable reservoir, the electrode provides a constant flow rate of reference electrolyte. 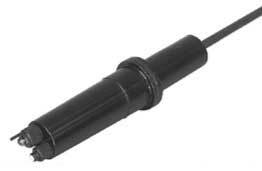 This provides for a longer, more economical service life, than fixed reference electrodes can provide. In addition, the electrode is independent of the effects of process pressure. Therefore, the use of independent air pressure (as is used with a salt bridge) is not required. To counter the low response speed and the effect of the alkali components of the glass electrode, special low- impedance S-glass electrodes were developed. They have a chemically resistant glass texture and very good response time due to their low impedance. An alternative to a separate glass and reference electrode is a combination electrode with the capability to pressurize the reference portion. In addition to the benefits already stated, the close proximity of the two measuring elements helps insure electrode circuit continuity. Noise problems resulting from ground loop potentials are addressed by the design of the pH transmitter. 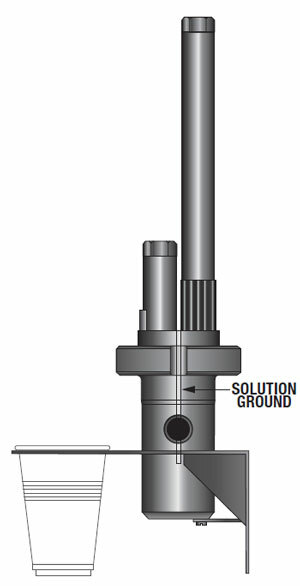 Many pH transmitters utilize a single-ended amplifier design. This design allows current (leakage current) to pass through the reference electrode, giving an offset in addition to shortening the useful life of the reference electrode. With the differential amplifier design, this leakage current will flow through the solution ground, not the reference. Therefore, no offset occurs and the reference electrode is not adversely affected. To prevent the increase of static potentials a stainless steel flow chamber is recommended. Since most plastics are not completely gas tight, such a chamber will also prevent the absorption of CO2 from the air. 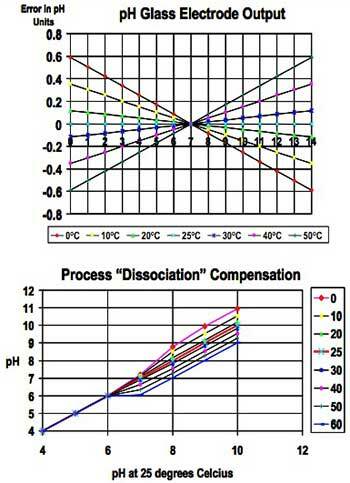 The sample temperature should preferably be in the 20 to 30°C range and remain constant. Measurement of pH in high purity water is a difficult measurement at best. In order to achieve a successful measurement, care must be taken to address the unique problems of the application. Selecting the proper electrodes and holder will eliminate problems with reference junction potentials, slow glass electrode response and surface static charges. Selecting the proper transmitter or analyzer will eliminate ground loop problems and allow for accurate temperature compensation for both the Nernst potentials and the dissociation constant of pure water. In addition, sensor diagnostics gives the operator the ability to assure the measurement loop is functioning properly. Yokogawa has the electrodes (Bellomatic reference and special G-glass measure electrode, or combination style); the sensor holder (model FF20/FS20 stainless steel flow through style); and the transmitter or analyzer (Models PH450G/FLXA21 with sensor diagnostics and "process temperature compensation") to provide an accurate pH measurement in high purity water. The major players in pure water pH applications are Power Plants, however any site that has a boiler will need to monitor the pH of their feed water. Pharmaceutical applications also demand pure water where it is used as an ingredient. Note: For additional information or assistance with there applications, please contact Yokogawa Analytical Product Marketing.